With central banks holding interest rates near 0%, many retirees are searching for yield. Traditionally, stocks have always been seen as inherently more risky than fixed income, and certainly cash. Still, some people have no choice, needing the income to finance a retirement. For this purpose, some stocks are obviously better than others. In particular, The Procter & Gamble Company (NYSE:PG), McDonald’s Corporation (NYSE:MCD) and General Mills, Inc. (NYSE:GIS) are well suited for the portfolio of retirees — each offers relative safety with a solid dividend. Procter & Gamble owns a number of iconic everyday brands, including Bounty, Dawn, Oral-B and Tide. Most of the company’s products are indispensable, and continue to sell despite any economic headwinds. In the depths of the financial crisis, P&G shares slid roughly 40% from their pre-crisis levels; bad no doubt, but better than the broader S&P 500. The company sports a dividend yield of about 3%. Its price-to-earnings ratio of slightly less than 19 is in line with the broader market average. Its forward PE is nearly identical. The most interesting thing about The Procter & Gamble Company (NYSE:PG) has been the involvement of activist hedge fund manager Bill Ackman, who took a stake last fall. Ackman has been critical of CEO Bob McDonald, saying in January that he ought to be replaced. Some might think that Ackman’s involvement could be a sign to stay away — particularly after his man Ron Johnson failed so spectacularly at J.C. Penney Company, Inc. (NYSE:JCP). 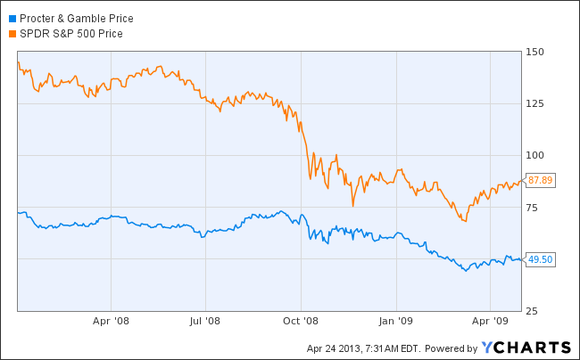 But P&G is over 50 times larger than J.C. Penney, so Ackman can’t force too much change. Despite revolutionary new competition like Chipotle Mexican Grill, Inc. (NYSE:CMG), McDonald’s Corporation (NYSE:MCD) remains a fast food stalwart. Its core business remains a symbol of American culture, and the company is well diversified globally. The company has always been willing to innovate with its menu; the premium coffee drinks it rolled out over the last decade have been a hit. More recently, McDonald’s added three new menu items — an egg white McMuffin, the McWrap, and a blueberry pomegranate smoothie — to capitalize on new food trends. McDonald’s Corporation (NYSE:MCD) yields roughly 3.10% — just a bit more than The Procter & Gamble Company (NYSE:PG). In the depths of the financial crisis, it dropped only about 12%. That isn’t to say that McDonald’s stock is impervious. About a decade ago, the company struggled with fears over Mad Cow Disease, and Buffett abandoned the stock in the late 1990s. But shares have obviously rebounded, and are now trading near an all-time high. Speaking of Buffett, General Mills is a company the Oracle of Omaha might have an interest in. He’s been linked to the company in the past, with a few market observers speculating that he could attempt to purchase the company. Like P&G and McDonald’s, General Mills’ yields right around 3%. Its price-to-earnings ratio is about 18.5, right in line with the market. General Mills, Inc. (NYSE:GIS) has many of the attributes of a typical Buffett company: it makes a product people consume every day, and it has a well-established business with few competitors. Shares slumped only about 11% during the financial crisis.